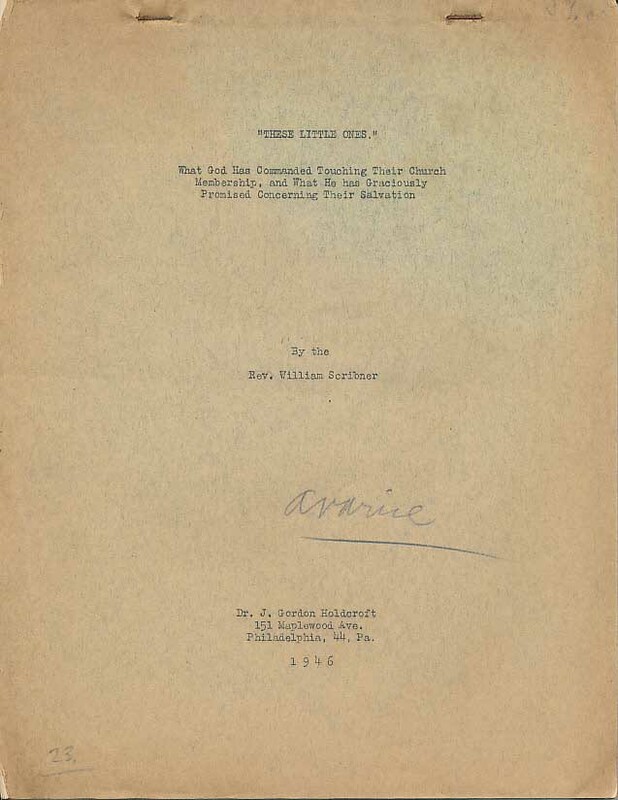 Currently I’m building a database of our biographical files in the PCA Historical Center and came across this interesting item, a privately published edition of These Little Ones: What God Has Commanded Touching Their Church Membership, and What He has Graciously Promised Concerning Their Salvation, by Rev. William Scribner [1820-1884]. The work can be read online using the embedded link. William Scribner was born in New York on January 20, 1820, the son of Uriah and Betsy Hawley Scribner. He graduated from the College of New Jersey (now Princeton University) in 1840 and prepared for the ministry at Princeton Theological Seminary, graduating as part of the Class of 1843. Serving first as stated supply for a church in Columbia, PA, 1843-44, he was ordained by the Presbytery of Newton, November 13, 1844 and installed as pastor of the church in Stroudsburg, PA, 1844-49. Leaving that post, he served as stated supply in South Salem, NY for a year (1850), and then answer a call to serve as pastor in Bridesburg, PA, 1852-54. It was during this pastors that he married Julia Sayre of Plainfield, NJ, on September 20, 1853. Two sons and two daughters were born to this marriage. He was pastor of the Presbyterian church in Red Bank, NJ, 1855-58 and finally stated supply in Des Moines, IA, in 1863. He resigned the ministry due to failing health, and retired to Plainfield, NJ and later died there on March 3, 1884, at the age of 64 of Bright’s disease, a chronic inflammation of the kidneys. He is buried at the New York Marble Cemetery, Second Avenue, Manhattan, New York. Rev. Scribner’s brother Charles was the well-known New York publisher and founder of Scribner’s Magazine. Together with his brother Charles, he became a member of the American Whig Society in 1838.
of the late Rev. William Scribner (elder brother of Charles Scribner, the publisher) while a student at Lawrenceville. “ He came to me,” says Mr. Hammil, “ and said, ‘ I have found the Saviour, and I wish you would tell my companions.’ I said to him, ‘ William, you had better tell them yourself. It will do them and you both good.’ He stood up and said, ‘My dear schoolmates, you have, perhaps, not understood why I have not been out upon the playground as much as usual for some days past. I have been seeking the salvation of my soul, and trust I have found my Saviour, and wish to tell you how much joy I have.’ After prayers, William came to me and said, ‘ I wish you would speak to my brother Charles, and pray for him.’ I promised to do so. Like Andrew the Apostle, he was desirous that his brother should see Jesus. In a few days, Charles, his younger brother, was indulging a good hope of an interest in Christ. [Source: Boys Worth Noting. Sunday School Union, 1884, p. 54. Originally published in 1878 as a small book with 192 pages, by the Presbyterian Board of Publication (PCUSA), our edition, pictured below, was privately published by J. Gordon Holdcroft, who was at that time serving as General Secretary of the Independent Board for Presbyterian Foreign Missions. Apparently Dr. Holdcroft thought highly of this book and as it was probably hard to find a copy, he privately published it. This copy is 57 pages long and is bound by two staples at the top of the sheets. In faint pencil in the upper right corner of the cover page, a price of $1.00 can be seen. While some thirty-three libraries around the country hold copies of the 1878 publication, I could not find any libraries that house a copy of this privately published edition. II. The Believer’s Covenant with Christ when he first exercises a living faith.—The Covenant which is externally enacted by all who profess the Christian Religion. III. First Step in the Argument for the Church Membership of Infants. IV. Second Step of the Argument.—The Answers to this argument which have been attempted shown to be inconclusive.—The Conclusion reached. V. Objections considered.—Partial restatement of the Doctrine. VI. The Promise of our Covenant-keeping God to Bless and Save the Children of His People. 1873 – Pray for Your Children; or, An appeal to parents to pray continually for the welfare and salvation of their children. 1876 – Pray for the Holy Spirit. 1880 – The Savior’s Converts, what we owe to them and how we may aid them. 1882 – Love for Souls. A review of The Life and Letters of Frederick William Faber, which appeared in The Princeton Review, 43.4 (October 1871): 515-532.